Open the site in SharePoint designer 2010. 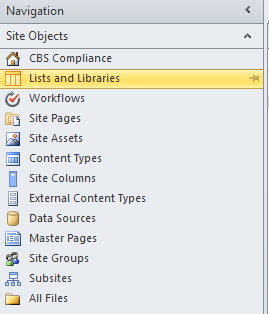 Open the page used to view and manage the settings for the list by selecting the list from the Lists and Libraries page, which you can get to from the Site Objects toolbar. Uncheck option “Display this list on quick launch”. Check the “Hide from browser”. 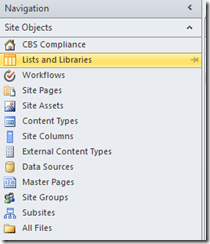 Open the SharePoint site in the browser and confirm that you list is now hidden. Click the “All Files” folder at the bottom of the Site Objects toolbar. Now you have your hidden list’s property page open in SPD. Uncheck the “Hide from browser” and save. NextWhy Are You Applying a Fixed Width To A Collaboration Site?